Problem with outreaching is that it is practically a sales pitch, but with a pre-sell approach. There’s hardly ever any second chance with outreaching. If a blogger, for example, has ignored your first mail, how receptive do you think they are likely to be to your subsequent approaches? 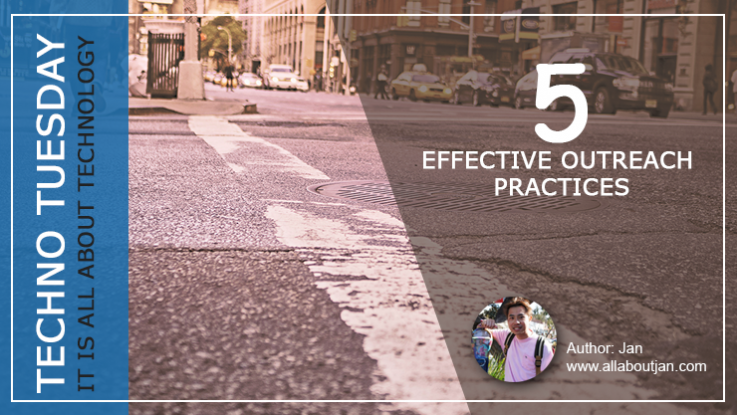 There are two parts to a successful outreach approach, and here are 5 effective outreach practices that should make things easier for you. This is very important: as with everything else, you need to know what exactly it is you are looking for. Do you want a mix of no follow and do follow links? Are you looking to narrow down your target to something exactly within your niche or are you aiming for peripherals as well? If so, how do you plan to convince a fellow site owner to accede to your request when you are not directly related to their niche? Remember the fact that there are no second chances and be prepared with a definite plan. Nothing is as unprofessional as an outreach email as Johnsmith@Gmail.com. Make that any mail instead of Gmail, and it still remains unprofessional. You want a brand to represent you all the way. Even if your site or blog has not gained brand popularity yet, the very fact that you have your own domain name serves to distinguish you. If you have tried getting into CPA networks you would know that some of them specify that you must have your own site email id, and others state that there’s no guarantee they will respond if you don’t. This cannot be stressed enough. Even if, somehow, you are doing well without your own domain – like a sub domain blog that has gained huge popularity through remarkable efforts on your part, you would still want your own domain. Either turn your blog into a paid domain – easy to do with both WordPress and Blogger, or, if you are superstitious and don’t want to change anything, get a domain similar to the one you already have just for the purpose of having your own email id. Now that we are done with the preliminaries, let’s get to the next level which is the actual approach. It is easy to send a mail to the general contact address listed on a site. That will, in most instances, do you no good. Outreaching is a more personalized business than that. Do a bit of research, call up a few people if necessary, ask around for the right person to contact and get their email. Don’t skimp on this part or the rest of the tips you are about to read will be of no use whatever. Yours is not the only mail reaching your contact person’s Inbox, and if you are a stranger (which is usually the case), there is no particular reason for the person concerned to prioritize it. In fact, the only reason they will open the mail is if they are sufficiently curious about it. Don’t go overboard; don’t try to come up with fancy subject lines that mislead. You don’t want to be labeled as spam. Writing something like ‘Here’s an opportunity you don’t want to miss’ sounds too like a shady Internet Marketer trying to sell the latest get rich quick scheme. A professionally written subject line such as ‘ Attn. [Name & Designation]: Concerning [a certain section of] your website’ is likely to draw more attention. It shows a no nonsense approach and the addition of name and designation personalizes the mail just enough to show the recipient that it is indeed intended for their eyes. Repeat: name and designation – don’t ever miss them. Actually, you could give the designation a miss if takes up too much space, but sending a mail without addressing an individual with their name would be an unforgivable mistake. Why would anyone take your mail seriously even if you got them to open it? Probably because you are giving something to them, or they feel they have something to gain from you. If you are the one trying to outreach, it goes without saying that you NEED something from them rather than it being the other way round. Remember that yours is an unsolicited approach. Visualize yourself as being a door to door sales person trying to sell something the prospective buyers would benefit from, but something that they ordinarily would not need. A ‘better’ vacuum cleaner or a water filter that provides ‘healthier’ water and so on. If you are not able to make the pre-sale in about five seconds or so, the door shuts on your face – forever. Therefore, write a succinct mail that shows you have actually been through their site with serious intent. If you find broken links, point them out. If you don’t, compliment them on how you didn’t find any, and how everything is so perfect. Make sure you don’t write beyond a few well chosen words on this. What you write must stand out the moment they look at the mail – and persuade them to read the rest of it. Next, mention your proposition, but always in the form of a polite request, and don’t ever write ‘link to my site/ blog’. The word ‘link’ tends to trigger memories of practices that have been severely penalized by Google. People are immediately wary when you want them to link to you. Instead, go with something like ‘ I have content that is similar to your theme – I would really appreciate if you looked at this post [link here] and left a comment.’ You can treat this as the first step and end there. Or you can take it further and say ‘ If you do like it, would you care to put it on your site / news section/ [anywhere else that is relevant]’. You are not conning anyone, so there is no need to pretend that you DON’T want a link, but how you put your proposition across makes all the difference. And finally, end with a sign off that suits the tone of your mail. Anything from a ‘Fellow Blogger’ to ‘Director in Chief [Company Name]’ goes, but it must not appear jarring. Most experts also opine that it is best to leave out designations that include the words ‘marketing’ or ‘sales’. Anything to do with Outreach Coordinating is perfectly alright, and makes your mail even more transparent. It is important to understand that these are not the only effective techniques, but they are the ones that you cannot do without. Add your own twist or simplify things any way you see fit, but your overall approach would remain pitifully incomplete if you should leave out any of these 5 effective outreach practices. I love to chill and I love to sing. I enjoy every single moment in my life with my lovely family.